This entry was posted on December 6, 2014 by Tinteán Editorial Team/EMcK, in Features and tagged EU, Irish economy, Water payments. Bookmark the permalink. Ireland is set to become the fastest growing country in the European Union (EU) this year, the European Commission has predicted, with the economy expected to grow by 4.6 per cent this year. Over the past few months economic and business reports have indicated that the Irish economy is well and truly out of recession and that the so-called austerity measures imposed by the EU’s ‘Troika’ (the IMF, the ECB/European Central Bank and the EU) in the economic bailout of 2007, can be eased. This should be very good news for both the Irish people as well as the incumbent government of Enda Kenny (FineGael). In fact, Ireland is once again riven by the government’s decision to impose yet another EU prescription onto the country. For the first time – since 1997 – Irish people will have to pay for water usage. 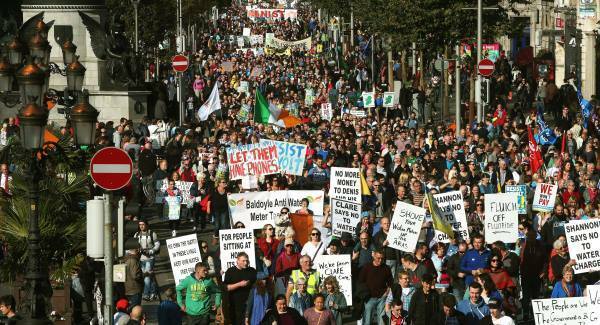 Over two hundred thousand angry householders have taken to the streets in the past few weeks, mainly in Dublin and Limerick, to protest against the Government’s policy to remove the privilege of free water usage. So what are the arguments for and against the change? The arguments against what are seen as intrusive and draconian demands of the EU Troika are pretty straightforward. The protesters have put forward several good reasons to reject the EU demands – Ireland certainly – famously! – does not lack the natural resource of water. It rains most days, and as a result the country has thousands of river systems, lakes, marshes and puddles. There is an embedded, though false, belief that water has always been free. Protesters are also fed up with austerity measures, which they endured for seven years (2007 – 2014) before Ireland was freed of the tag of being an economic basket case. In many cases, protesters have pointed out that the charges for water usage are prohibitive and beyond the reach of many of the poorer citizens who were probably hardest hit by the austerity measures in the first place. Anger against Mr Kenny and his government is not only building but may provide the catalyst to bring the government down. If the idea of a government falling over water usage charges seems farfetched, then the size of the protests against this measure (pictured left) give an idea of the outrage evoked by the idea in Ireland. But how reasonable are they? There seems to be evidence (see below) that when a resource is plentiful and free it has been taken for granted and mismanaged. The arguments for imposing the measure boil down to one simple idea. The EU wants member states, of which Ireland is one, to charge for water. The Irish Government therefore does not see that it has any choice in the matter. EU directives, agreed to by all EU countries, including Ireland, in ‘The Water Framework Directive’ of 2000, for the use and management of water usage, are uniform across the European Union. Article 9 of the water directive requires charging for domestic water. And she clarified that so far as the members are concerned, ‘EU directives are binding’. However in a twist of fate, the redoubtable Bertie Ahern, then Taoiseach, brokered a deal with the EU, known as ‘The Irish Exemption’ (Article 9.1) absolving the Irish government from the requirement to charge for domestic water! Only Ireland, – until now – is legally exempt from the requirement to charge for domestic water usage. This exemption can only be over turned by the Irish government, so alone among the member states, Ireland has some freedom of action about water charges, much as this is denied by government commentators. The Troika moreover insists that the Water Framework Directive imposes a legal obligation on all participating countries to bear the cost of their water services, despite the Irish Exemption And it has made compliance to the 2000 directive an obligation to be met by the Irish Government if Ireland is to return to the economic EU fold. independent economic regulation of water services, assigned to the Commission for Energy Regulation (CER). The objectives of these reforms are to protect public health, increase economic competitiveness and conserve our environment. Ireland needs a clean, reliable drinking water supply and coastal waters, rivers and lakes free of pollution. As water resources become more critical, due to economic recovery, population growth and climate change, increased infrastructural investment and improved service delivery are needed. A high leakage rate needs to be tackled and drinking water quality improved. (Water Sector Reform – Department of Environment, Community and Local Government). provision for circumstances where water quality is impaired or where services are reduced or restricted. It is doubtful that such concessions will assuage the anger of those Irish citizens who see themselves as being exploited both by their own government and the machinations of the EU, ECB and IMF. As far as the protesters are concerned one of their basic human rights – access to ‘free’ water is being violated. This belief is held despite the fact that domestic water has not always been free in Ireland. Whether the Kenny Government can persuade them that there is no such thing as ‘free’ water in an urban society, or that until 1997 water rates were a fact of life and were used to ensure an efficient and healthy water infrastructure, remains to be seen.